In less than a week, more than 50 national competitions from countries and regions across the world take part in the 8th edition of Wiki Loves Monuments, the largest photo competition in the world. 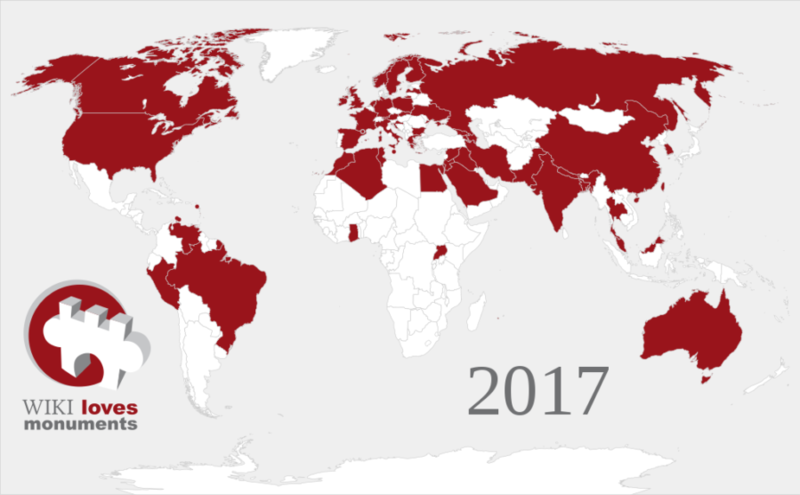 Throughout the month of September, people in these countries will be invited to share photos of their national heritage through Wikipedia. Organizing Wiki Loves Monuments relies almost entirely on volunteers who get together to make the contest happen in every participating country. Over the span of the past 8 years, the community of Wiki Loves Monuments has collected information about more than 1.4 million monuments across the world, has welcomed more than 46 thousand new volunteers to Wikimedia projects, and has created a global community of people who are passionate to share their cultural heritage with the world through Wikipedia and other Wikimedia projects. We need people like you to make Wiki Loves Monuments a success again. You don’t need to wait for us. Go through the guidelines for local organisers carefully and make sure you start making progress in each of the categories discussed in that page. If this is the first time your country is participating in Wiki Loves Monuments, it is especially important to get started on this checklist very soon. If you have questions or need the international team’s help with any of the items, please post your questions at the help desk. If you need any help at all, we’re here to for you. You can ask for help from organisers in other countries, or talk with the international team. They usually can remove some of the blockers for organizing the contest in collaboration with you. 🙂 Also, follow us on Twitter or join the Facebook group. Looking forward to this edition of Wiki Loves Monuments!